Hey friends, my blog output has been less than optimal because I’m writing my novel. Many of you are cool to ask how its going. It’s going. Ha! In July, I gave you a snapshot of the first part of Chapter 1 (HERE). Check that out first, if you haven’t read any of it yet. Without further ado, here’s the preview of the rest of the first chapter. All rights reserved and all that lot. There were sounds, muffled. Eve started to perceive them. In the moment between asleep and awake, real and imagined sounds mingled. She moved, her neck and joints creaking as she floated in the cryo fluid. Her eyes were still clamped shut. She started to perceive the actual cold—the freezing fluid. Her body began to shiver, though the fluid was warming steadily. She stayed still for a few more minutes. There were tubes in her nose and mouth. She could feel her tongue against the breathing apparatus. Her jaw ached. Her head ached. Eve went through the routines from training, mentally mapping out her arms and legs, almost reconnecting with her body. She perceived her toes and moved them, then her feet and legs, then fingers and arms. The fluid became bearably warm, though her body still shivered. Counting to three, she forced open her eyes for a second then squeezed them shut, the fluid stung a bit, more from the cold than any irritant. A moment later she opened them again. Her cryo tube lights were on, as was the interior display screen. There were no alarms, no klaxons, no signs of a shipboard emergency. Eve was being allowed to wake up at her own pace. She sighed, relieved, and floated for another few minutes. The display screen’s large font made it easy to read through the fluid. The system was on standby, waiting for Eve to push the button to start the opening process for her tube. During emergencies, the ship would take the liberty of doing that for the tech, unceremoniously dumping the groggy traveler onto the freezing deck in seconds. Eve was thankful for the normal wakeup. Eve began to shiver again. She opened her eyes, found the ENABLE button on the display and pressed it. Some loud metallic clunks and hisses sounded through her tube. A seal cracked and the cryo fluid began to drain away. Eve sank a few inches to the cushions of her tube. The still colder air of the ship’s interior hit her nose and slowly washed over her face and body. She reached up to rub her eyes. The wires and electrodes tugged at her arms. A final crack and hiss and the tube lid lifted up and away. The room was dark, save for the spotlight from the ceiling on Eve’s tube. Eve sat up and gagged out the breathing mask. She clung to the edge of the tube and endured her first coughing spell, one of what would be dozens over the next few days. Her skin squeaked and pulled against the leather cushion pads. The sensation of gravity still felt new. She caught her breath and relaxed, still shivering but more awake. Her breath shot out in ragged plumes into the dark of the room. She noticed some status lights shone through. On the far wall was her medical diagnostic screen, still reporting data from the probes and sensors attached on her body. She looked down at the probes, then at her arms. They were heavily muscled. In fact, her whole body had been toned and developed in cryo. She ran her fingers along the lines of her abdominals and biceps. She wasn’t sure how to take her new muscle-bound self. She also didn’t much like that it probably meant a deployment on a high-gravity planet or moon. Such missions were unpleasant even with the additional muscle mass. Sighing, she started peeling off the probes and wires and coughed some more. She looked through the dark at her medical screen. She was now dead, according to her readout. There was another set of readings. Eve looked to the left and right past the empty adjacent tubes. There, about three tubes down, was another tech, still in cryo sleep. Another tech? It was unusual, but not unheard of. The crew compartment could support up to 10, but in Eve’s years of service, she never heard of more than two on a deployment. Eve signed again. Another tech meant a more involved mission—not the wake-up/boom/go home missions she enjoyed. That, or it meant a training operation for the second tech. Either way, it would keep Eve awake longer than usual. Eve groaned as she swung her legs over the edge of the tube. She rubbed her eyes again and yawned. Her shivering had subsided a bit, but it was still very cold inside the ship. The heating elements must not have been on very long. She eyed the deck, knowing space would have kept the metal at an uninviting temperature during the trip. She looked over to the far wall. Under her flatlined medical display she could make out the faint outlines of the bins with towels. Showers and personal effects would be down the hall of the crew compartment. She held her breath and hopped down. The searing cold of the floor caused her to hop like a lunatic over to the wall. Eve yanked open the drawer and dumped several towels on the floor as makeshift sandals. She cursed, and pulled out another and started rubbing her legs and arms to get warm. The cryo fluid was full of nutrients and would be quickly absorbed into the skin. Still, her first order of business would be to get to the showers and fully wash the sleep from her. She was closer to the readout screen now and looked it over. Chief Warrant Officer Evelyn Roel, Chief Technician (Level 5), it said. Next to that was the emblem of her component, the FUS Auxiliary, showing her as one of those drafted into military service. Eve looked over at her companion’s readout. Her eyes were finally focusing as they should, though they, like most of Eve’s body, hurt from transit. Lieutenant Cassandra Matthews, Technician (Level 3), it read. An officer, Eve noticed. Again, not unheard of. And at least she was a level three, which meant she wasn’t a rookie. What did give Eve pause was her component: FUS Regular Forces—a volunteer. That was unusual. Eve tried to remember the last time she served with a regular. Eve stood draped in towels and noticed the other tube was still locked down. She was the only one waking up. That was odd, but Eve wouldn’t be able to access any ship systems or status reports until she’d dug out her visor from her equipment. For the moment, she was content the ship didn’t seem about to explode. Eve shuffled along the floor toward the cryo bay door in her makeshift sandals. She felt the walls. The heating elements were on, but the cold of space would take some time to shrug off. The ship was minimally heated and even the crew compartment stayed cold during the voyage. It would take a couple of days for the bulkheads and walls to absorb enough heat to take the biting cold edge out of the air. Eve made it to the open door and hit the light panel. The ship seemed to notice part of its crew was awake and turned on some lights. Floor and ceiling banks flickered on, their cool blue light added to the idea that Eve was in a meat locker. Even with the lights on, the crew compartment was dimly lit. She shuffled out into the passageway, the lights faded in the cryo bay and activated in the hall. The ship was tracking her movements, at least. “Morning, ship,” Eve said, and coughed. She continued shuffling down the hall. The smooth lines and panels of the crew compartment gave a cold, yet softer impression than the more utilitarian build of the remaining ship spaces she’d see later. Eve tried to imagine comfortably shuffling along the floor grating and exposed pipes and wiring of the maintenance spaces. Here, she could nurse her aches and hobble into the showers like an old woman if she wanted. She walked into the shower room. Again, a space built to accommodate up to 10 people. There was a bank of sinks and mirrors on the right. The shower modules were in the middle and went farther back into the space. Behind the shower modules would be benches, lockers and equipment bins—where her clothes and personal effects would be, so long as the loading drones had loaded the right containers at the expedition station. Eve shambled over to the sinks and tested the water. Warm, then hot. Good, Eve thought. She looked up at herself in the mirror. There were bags under her irritated eyes. She looked haggard, but most did after waking from cyro sleep. She noticed her face had slimed a bit, no doubt from the physical conditioning. Specifically though she wanted to check out her implants. She wore her hair longer on the top and left, leaving the right close cropped around the interfacing nodes. It was a hair style normally not allowed in the service, but was tolerated for techs, especially level fives and their unique hardware. She ran her fingers along the visor seating points on her temples. There didn’t seem to be any inflammation. She brushed aside her auburn bangs to better see the interfacing nodes. The grey metal plates blended with her skin well enough, even if it meant living with the bald patches. The port was clear, again no infections. She took a second and made some faces in the mirror. Her jaw and neck still hurt. She noticed the tense areas and stretched and yawned, then shivered. It was still freezing. Her mind turned back to the showers. She shuffled over to the module, second from the left, her usual, and activated the controls. Turning it on maximum heat, she waited for the steam to begin bellowing out into the dim cold space. The ceramic shower modules would become comfortably warm in no time. She hung up her covering towel, leaving the two piles on the floor, and stripped off her sleeping suit. Dialing down the heat a bit, she walked in to the comfortable warm embrace of the shower stream. She laughed, leaning against the module wall and letting the water leech the creaking cold from her body. 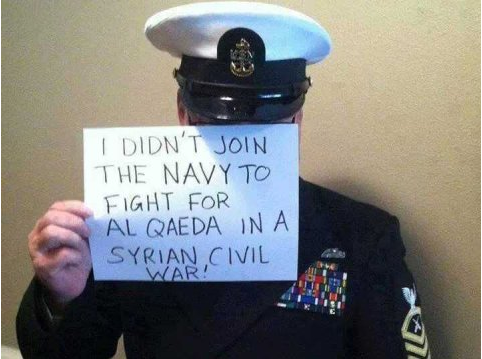 Hey active duty people, the president doesn’t need your Syria opinions! This morning I ran across this article in Business Insider (link). In it, supposed members of the military are holding up signs to hide their faces. Written on the signs are statements saying they are against military action in Syria—obviously a timely topic. I’ve been seeing some people responding across social media and getting amped up over it. A friend asked my opinion. Figured it’s as good a blog post as any. Given how few members of the public serve in the military (link), my mindset and response might be alien to most. On the other hand, given how off my damned rocker nuts I am, my mindset might be alien to my vet friends too. We’ll just have it out, then, shall we? To cut to the chase…I do have a problem with what these (alleged) service members did. However, I probably understand why they did it. However however, I still take umbrage. As a disclaimer, we have no idea if these people referenced in the Business Insider article are actually in the military, though their uniforms look pretty well put together, so signs point to ‘yes.’ Civilian posers typically do a terrible job at pretending to be in the military. Anyway, assuming they are legit vets, let’s look at why they probably did it and then why it’s a problem. We’ll have to take a little romp through recent history. The longest ‘war’ in US history. Remember when we first rolled in there? Yeah that was 12 years ago. Our involvement in WWII was four years, as a point of reference. Did you know some people deploy there constantly—often for a year at a time, with a short break and then another year there? Did you know there are still 60,000 US troops there? Still? Yeah, that gets tiring. And it spikes suicides (link), divorces (link) and other fun stuff (link). Did you know that we, the country who “does not negotiate with terrorists” are negotiating with terrorists (link)? Peace talks with the Taliban and (indirectly because of their ties) with Al-Qaeda itself. We’re hoping to make nice with the people we rolled in to eliminate. That might ruffle the feathers of the vets who’ve sacrificed limbs, friends and marriages to serve there—might make it seem all for naught. Right? Remember when we first rolled in there? Yeah that was from 2003-2011. People also often deployed there constantly—often for a year at a time, with short breaks and additional years there. Also contributed to the mental/emotional/physical and spiritual trauma of the American military. Remember all those WMDs we found there? Or all those direct ties between Saddam and 9/11? No? Think that also might ruffle the feathers of the vets who’ve sacrificed limbs, friends and marriages to serve there—might make it all seem for naught? Skipping ahead past Somali pirates, Libya, drone strikes, Pakistani entanglements…well, that brings us to Syria. The Syrian civil war began in 2011 and has, by many UN estimates, killed more than 100K people (link). Sir, Iran is backing Assad. Gulf states are against Assad! Assad is against Muslim Brotherhood. Muslim Brotherhood and Obama are against General Sisi. But Gulf states are pro Sisi! Which means they are against Muslim Brotherhood! Iran is pro Hamas, but Hamas is backing Muslim Brotherhood! Obama is backing Muslim Brotherhood, yet Hamas is against the US! Gulf states are pro US. But Turkey is with Gulf states against Assad; yet Turkey is pro Muslim Brotherhood against General Sisi. And General Sisi is being backed by the Gulf states! Welcome to the Middle East and have a nice day. So…I completely understand the exasperation of my uniformed brothers and sisters. It seems like another hopeless, ongoing perpetual conflict. I completely sympathize and empathize as to why many might feel compelled to speak out against their leadership and urge for not intervening in Syria. My umbrage seethes over this idea that men or women would use the uniform of the United States to undermine the leadership of this country. Referring to the alleged vets in the Business Insider article, they may think they are being slick by staying anonymous—that they aren’t hurting anyone—that they are simply using free speech or whatever…But they’re not. They represent something far larger than their individual political ideologies and agendas. In fact, Syrian hackers took over a US Marine’s website today and did just that (link). It’s not a matter of arguing for or against Syria—for or against future war. That’s not the issue here. They are catapulting themselves into the negotiations and national-level discussions in opposition to the US leadership. They are hijacking the system. Look, I hate war. I served, though. I went to Iraq, even if I didn’t think it was on the up and up. I served with distinction. I was decorated. I gave parts of myself to the maw of war that I won’t get back. I served because I swore an oath of enlistment (link). In it, I didn’t say “only the wars I like” as if I was some damned mercenary, selling my gun to a cause of my choosing. Nope. I said I would sally up and serve wherever the elected leaders of this country said I should, regardless of any personal objection. It’s how it works. It’s why people stand up and clap for vets on Memorial Day. It’s because they realize it was a choice to serve, no matter how much it might have sucked. And it’s how veterans deal with war. They don’t engineer them. They simply serve. And, while they’re serving, they should shut up in public about any objections. So, while I would be glad for the US to stay out of Syria, were I still serving as the fourth-generation of my family to wear the uniform, I would go if asked. I’d serve with honor…and I wouldn’t take the wind out of my leaders’ sails by posting some damned pictures giving aid and comfort to possible enemies. There have been a lot of things to get used to after hanging up the uniform. People don’t use pockets for anything in particular. They just shove their hands in there. For whole minutes. You can potentially not work out for days! Work doesn’t usually call on the weekends. Pt. 2, coworkers don’t call, needing to be bailed out after a DUI. Saying “yeah” won’t incur extra duty. Walking either on the right or left of someone is completely acceptable. You can walk around, completely *^%$^&@ oblivious. The last point has been getting to me. I mentioned it to a coworker. I’m actually not too keen on it. People are generally clueless to their surroundings. They bump into things, block doorways, block aisles, cut off vehicles in traffic, talk too loudly, trip other people, knock over stuff, on and on. In the service, there’s this state of mind called “situational awareness.” It’s almost this Zen-like state, where a service member is imbued with the near-godlike ability to know where he or she is in relationship to the universe. No, seriously. It’s pretty frikkin’ epic. You may not realize it, but most service members who haven’t gotten away with standing at parade pretty (entire other series of posts) know where they are. It’s awesome! What does that mean? It means a service member will wait for others to go through doors. He or she will say “sir” or “ma’am” when encountering another human being in the general vicinity. And generally, although American road rage trumps all, they will know when the hell to stop, yield and accelerate when it comes to vehicular traffic. It all starts at basic training. I remember it well. My particular unit stood outside in the January South Carolina evening air, which, contrary to what you might think, is pretty blasted freezing. We were told to exit the bus, quick like, arrange our backpacks in an orderly fashion, and extricate ourselves into a line all in a span of about 15 seconds. Of course, you might imagine what happened, all manner of hell broke loose. There was no coordination. There was no consideration. It was every person for him or herself. We bumped, tripped and shoved our way into the drill sergeant’s escalating rage once the requisite 15 seconds passed. Tests like that were designed for us to fail. Passing the test wasn’t the point. The point was to show how absolutely clumsy and self-centered the average person is. We’re like heifers, chewing the cud, oblivious to the semi trucks attempting to pass us on the road. We’re completely self-centered, expecting the world to pay us mind, pay us heed and worship us at our feet. We have more cars, clothes and money than 90 percent of the GD world, after all, there’s definitely a sense of entitlement that comes with that sort of nobility. So, it is the job of the drill sergeant (or drill instructor for our maritime friends) to undo the worthless, clumsiness of the average U.S. civilian. Thus begins our quest toward situational awareness. When a sergeant walks to work, you may see a confident stride and a sharp-looking man or woman; but inside, there are all manner of processes and checklists going off in that person’s head. Every single person that walks into a service member’s viewable area (six paces radius from all living things, for your information) must be checked for rank, uniform, disposition, proximity to others. A service member will see if there’s something in the person’s right hand (which there shouldn’t be, since he or she needs that hand to salute at a moment’s notice), and that hands are out of pockets. Service members will salute, if appropriate (depending on the rank, uniform, time of day). They will check to make sure others are behaving, that they are being respectful. They will stand ready to correct junior troops, alter their course if needed to stay on sidewalks, stop completely if a cell phone rings. They won’t chew gum or eat while walking. They will walk tall, taking 30-inch steps, their hands held in loose fists, as per regulation. They will scan passing vehicles to render honors if officer rank placards are displayed. They will watch for the right time of day to render honors to the flag in the mornings and evenings. All of it, just from walking to frikkin’ work, is to hone a person’s acumen for situational awareness. And it doesn’t stop in the states. There are a whole mess of other checklists service members go through in deployed environments. Over there, weapons must be carried properly, cleaned, uniforms maintained. Service members must keep a sharp ear out for incoming mortars, alarms, approaching vehicles. On patrols, they must watch out for piles of debris in the road, quiet streets before an ambush, influx of onlookers before an ambush, pot holes, wires, discoloration on curbs, orderly piles of trash compared with disorderly piles of trash. Vehicles must be listened to. Is the engine sounding healthy? Do the brakes feel right? Are there fluid leaks? How about the radio? Do the headsets work? Got enough ammo? Got trash bags? Got the stretcher? How’s the .50-cal? Barrel clicked in (learned about that one the hard way)? Sights clean? Pedestal pin in (yet another story)? When walking around, service members need to know where their barrels are pointing AT ALL TIMES. As they pass each other, as they walk to the chow hall, as they go to bed; is the chamber empty? Has the weapon been cleared? Where are all the other accountable items? Body armor? Ballistic goggles? Leaders must know when and where incidents occur, in the states, the field or downrange. What time did the rounds hit? What grid location? Whose battlespace are they in? What frequency should they use to call the medics? What’s the alternate in case there’s no response? Where are they? Where’s an alternate route to get around the roadblock? None of this aimless walking around. A troop’s mind needs to be on, sharp, at all times. Is it, always? Ideally, sure, but all troops are human. There are lapses, sometimes a lot. But they should be paying attention. “Get your head out of your @$$!” is a common verbal exchange as one troop points out the spacial perception lapses of another. I’m newly a civilian, and while it’s sort of cute it’s also a little unsettling to see how frequently people walk down halls, ear buds in, running into others, or seeing people back into people while looking for birthday cards, or how accidents occur with cell phone users in cars, nearly hitting me as I go to H.E.B. to get toilet paper. I guess it’s because most people haven’t had the pleasure of having situational awareness drilled into them almost literally. So it remains a quintessential skill possessed by few—that ability to analyze and categorize a dozen characteristics and traits of people, places and things entering and leaving a service members proximity every step and every second of the day. Wow, no posts since Feb? Whoops! So much for being the social media guy, right? To my defense, I’ve been a little busier than usual. Those in my normal circles have known, but the world at large may have been left out of the loop. I am leaving the Army. It has been about seven and a half years since I raised my hand and processed into the service. It was a whirlwind romance. I stepped into the recruiter’s office the day after New Year’s 2003 and was at basic training three weeks later. It’s how I roll, though. I have a tendency to completely reinvent myself every couple of years. Being in the military has been life changing in more than the usual ways since it has forced me to stick with one thing for nearly a decade. Still, time is time. I’ve had wonderful opportunities in the last couple of years. In January 2009 I started my tenure as the official DINFOS emerging media coordinator. I’d been working the social media scene since I arrived here in June 2007, but it was more of a hobby and personal quest for revolution, rather than any official capacity. Since my christening, I’ve worked with dozens of awesome peeps at the DOD, major command and service level. I had the chance to go to SHAPE, the military arm of NATO, and contributed to their first strategic communication directive working with social media. I’ve been on the DOD’s all-services social media council and threw my $0.02 in on DTM 09-026, the DOD’s first social media policy(ish). My time at DINFOS was winding down, though, and I had a choice. I could stay in the Army and go on to do the normal E7 stuff, or I could let my enlistment expire and continue with the social media fight in DOD. Although I was surprised to make the E7 list with just six years in, I wouldn’t be able to keep working in my social media circles while in uniform. There are no positions like mine at DINFOS in the regular military. There will be in a few years, but for now, I have to get out of uniform to keep working for those in uniform. Strange huh? I think so also, but that’s the way of things. My former chief of public affairs, Maj. Gen. Bergner, had been tremendously supportive and offered to give me whatever assignment in the Army I wished to keep me in, but I’m hardly close to retirement. Fourteen years is a long time. Even if I stayed around for one more tour, eventually, a couple of years from now, I would have to return to “normal” military assignments: checking humvees, planning field problems and deployments—which is no problem, but I’d miss out on influencing the DOD social media discussion. If I could just do more years in the desert and still come back to what I’m doing now, that might suffice. But I might as well just get out, get paid a lot more, do what I want and NOT have to get shot at anymore. It becomes a pro/con thing.